The Proxxon Disc Sander TG 125/E is useful for all types of wood, steel, non-ferrous and precious metals, as well as plastics. This unit is powerful and vibration-free due to a balanced DC motor. Shipped with the included c-clamp, this sander can be mounted horizontally or vertically to a table or workbench surface for added versatility. The General international 2-in-1 Belt/Disc Sander was built for versatility with its 0 to 45 degree tilting aluminum work table which can be adjusted for miter polishing. 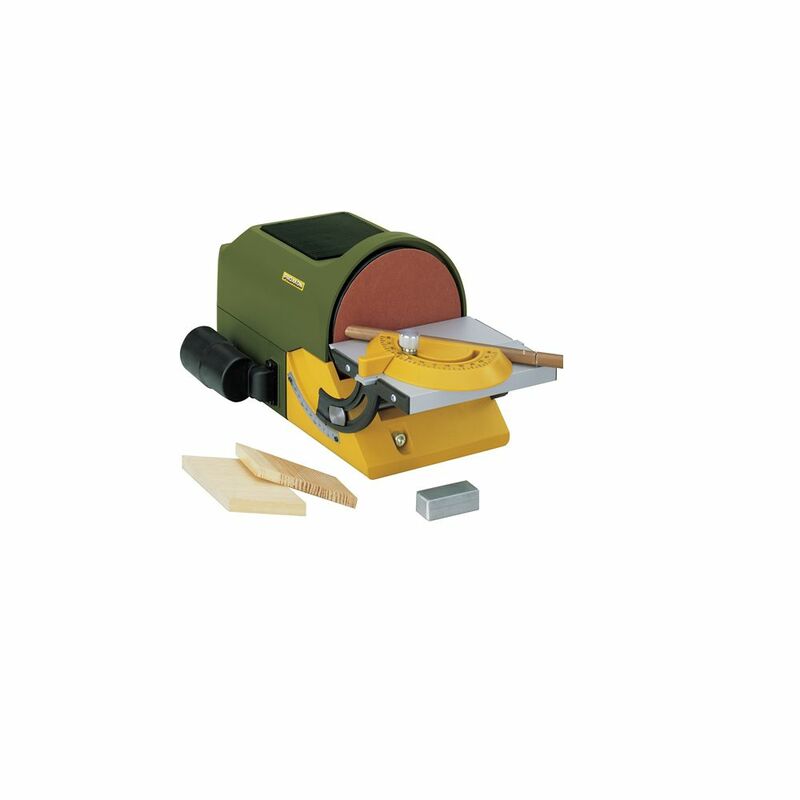 Included with the belt disc sander is a miter gauge for steady sanding on angled edges, an L shaped stop bar for safety and control, and a 2.25-inch dust port to connect a dust extractor. The 16-1/2 inch x 4-7/8 inch. belt sander tilts to work both horizontally and vertically for grinding and polishing flat surfaces. It has a 6-inch diameter Aluminum disc backing plate. With a 4-amp 1/2 HP motor, users should anticipate enough power to prevent this machine from bogging down under a large load. The belt bed adjusts anywhere from 0 to 90 degrees. Powerful 1/2 HP, 5.8 Amp induction motor, Handles all of your finishing operations including sanding, surfacing, grinding, cleaning and deburring on wood, metal and plastics, solid cast-iron body and steel base add stability and minimize vibration, Integral 1-3/4 belt and 2 disc dust ports for shop vacuum hook-up and comes with sanding belt, adhesive sanding disc, miter gauge and adjustment hex. keys. Powerful 1.2 HP 8 Amp. Motor, with manual brake quickly stops sanding disc and solid cast-iron base and disc housing that increases stability. Equipped with aluminum table tilts to allow angle sanding up to 45. Comes with adhesive 12 sanding disc and miter gauge. 4.3 Amp. Motor, adjustable/removable backstop, easy belt tracking system and belt tension lever for quick changing of sanding belt and handles all of your finishing operations including sanding, surfacing, grinding, cleaning and deburring on wood, metal and plastics. Disc Sander TG 125/E with Dust Port and Adaptor The Proxxon Disc Sander TG 125/E is useful for all types of wood, steel, non-ferrous and precious metals, as well as plastics. This unit is powerful and vibration-free due to a balanced DC motor. Shipped with the included c-clamp, this sander can be mounted horizontally or vertically to a table or workbench surface for added versatility. Disc Sander TG 125/E with Dust Port and Adaptor is rated 4.5 out of 5 by 2. Rated 4 out of 5 by AJ from The sander worked well for what I needed, it is difficult to change sand paper to the disk. The sander worked well for what I needed, it is difficult to change sand paper to the disk. Rated 5 out of 5 by RadiationTimes from Excellent sander Sturdy and precise construction. The vacuum hookup is a very important feature, and I'm unaware of any other compact disc sander with this feature. Bench clamp is solid.